In stock 93 items in stock. Having issues getting this to work consistently with a SparkFun SAMD21 LoRa Pro RF board. Best case, it will run for several seconds, then the readings will freeze. Various settings of timing budget and intermeasurement period did not make a difference. Most of the time it doesn't make it past the first library function call in the setup function. This leads to an optical center value being assigned and distance values will be returned. This might help someone struggling with the same problem. Today I try the software With a Arduino M0 (ATSAMD21G18) After loading the software the board was unusable. no connection possible. I have try it several times every time I had to program a new bootfile. I don't know what I do wrong, using a other library (simple one) works fine. I am trying to create a traffic sensor / data-logger using sensors like this. This will be used out of doors, so ambient light is a serious concern. I don't need millimeter accuracy. In fact, I was originally considering a simple IR emitter/detector sensor pair bouncing off a reflective surface. The easy-to-assemble Qwiic systems sound like an answer to my prayers without having to re-design the wheel. The VL53L0X was quite disappointing in broad daylight, which was to be expected, but also under controlled office lighting conditions. The usable range, where no ambiguous triggers occurred was around 1 metre under office lighting and on late overcast afternoons and around 1,5 metres in near darkness. It helps putting a 2-3mm tube around the receptacle part of the sensor to prevent stray light from entering too soon. Also, distance varied by as much as +/- 20mm depending on colour, reflectance and porosity of the obstacle's material. Is this new sensor, with its tiny lenses, noticeably better? Have you had a chance to compare it to the VL530X side-by-side? How is the performance in strong ambient light outdoors? Is there any special housing that's necessary to improve the performance in such environments? Can I measure the distance of a metal bob inside a metal tube of 4cm diameter with this module?....Will the laser bounce off the walls of the tube? What I want to know is how this module runs on 3.3 volt? Everything in the STM documentation states 2.8 Volt with 1.8 volt I/O. 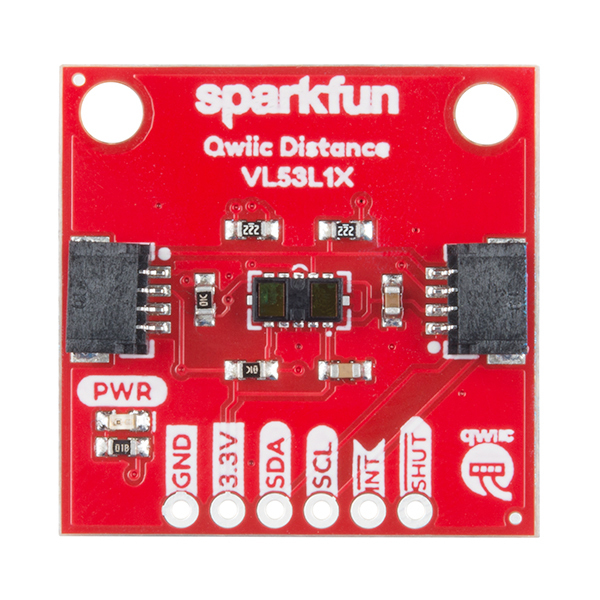 As far as I can tell Sparkfun has the only VL53L1X module that runs on 3.3 volt with I/O on 3.3 volt. Excellent question. Under Technical Specifications it indicates the operating voltage is 2.6 to 3.5V. Under 5.2 of the datasheet, Recommended Operating Conditions, it indicates there are two modes of this board, default, which is 1.8, and 2.8 mode. 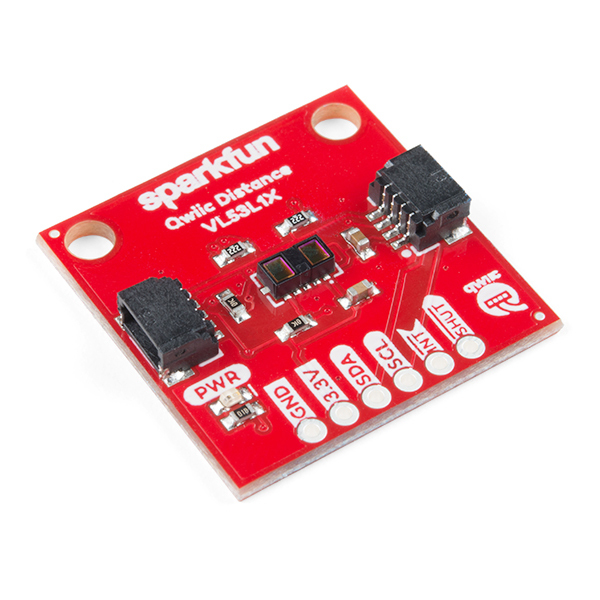 The absolute max of this board for supply is listed as 3.6V. This is I2C, so your communication lines pull the signal low and are driven by pull up resistors. The voltage across your pull up resistors will dictate your I/O voltage, which if you give this board 3.3V will be 3.3V, within the specifications of the manufacturer. TOF Lasers don't measure water reflections, sit something floating on the water, something that is highly reflective, shielded from outside light and baffled from 'wave noise' works fine. No problems encountered during limited testing. I found the ST data sheet but I was unable to find out how to manipulate the registers in the device to, for example, change the I2C address so I could put more than one sensor on the bus. Looks like ST is keeping that info close to the vest. It does work fine as a single sensor. 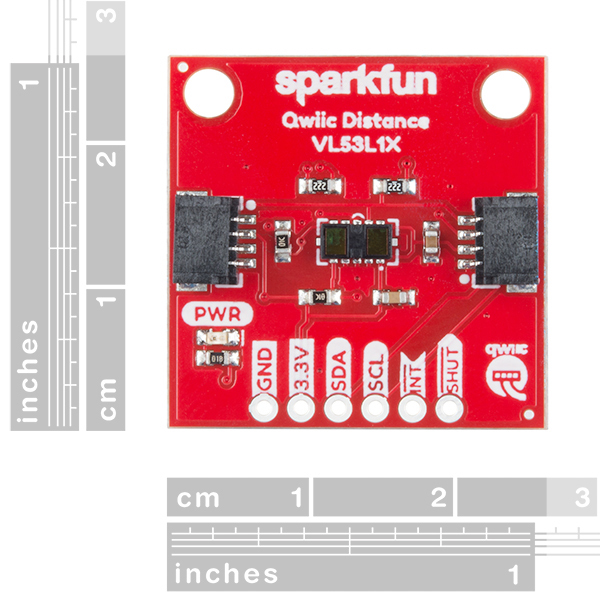 I was looking for a distance measuring sensor using the Qwiic hardware platform for measuring distances between 40mm and 300mm for a robotic project. 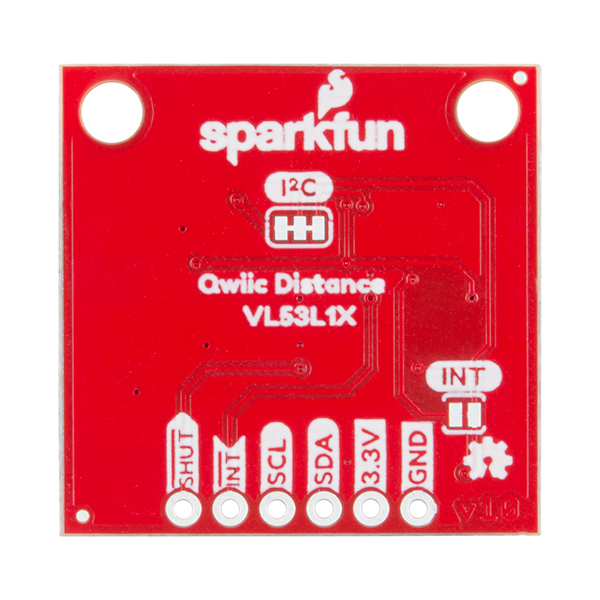 I've tested the VL53L1X sensor with a "SparkFun RedBoard - Programmed with Arduino", a "SparkFun Qwiic Shield for Arduino", and the "SparkFun_VL53L1X_Arduino_Library.h" library mentioned in the "Qwiic Distance Sensor (VL53L1X) Hookup Guide". I can't get any reading for any distance below 125mm in either of the 3 distance modes. And at 125mm, the sensor would provide a reading of 1~2mm. So that doesn't match the advertised feature of a reading range starting from ~40mm. the readings are off by 125mm to 30mm between 125mm and 500mm respectively. But they are getting more accurate as the distance increases. and despite what is stated in the Sparkfun product description, I couldn't find any protective sticker on the VL53L1X that would explain such bad readings. you won't find in the Arduino library the examples # 4 and 6 and the functions for setting the intermeasurement period and to calibrate the sensor as illustrated in the hookup guide. the I2C address is 0x29 and not 0x52 as mentioned in the hookup guide. I was able to make it work on a micro:bit connected to a moto:bit by following the I2C programming sequences from the Arduino library. The VL53L1X is definitively not worth the money for my application. An ultrasonic Sensor HC-SR04 does a better job for $4. While outdoors in direct sunlight is a problem for this sensor (as I would expect) it works indoors very well. I have had extremely good luck and results in my applications. My FIRST team wanted to use the sensor on our robot. We had trouble working with the I2C interface on the RoboRIO, but I was able to interface with an Arduino and talk to the RoboRIO over a USB interface. Just added a new driver for Raspberry Pi 2 and 3 and Zero to be used as a Time of Flight platform for Homeassistant open source software. Please check links below.